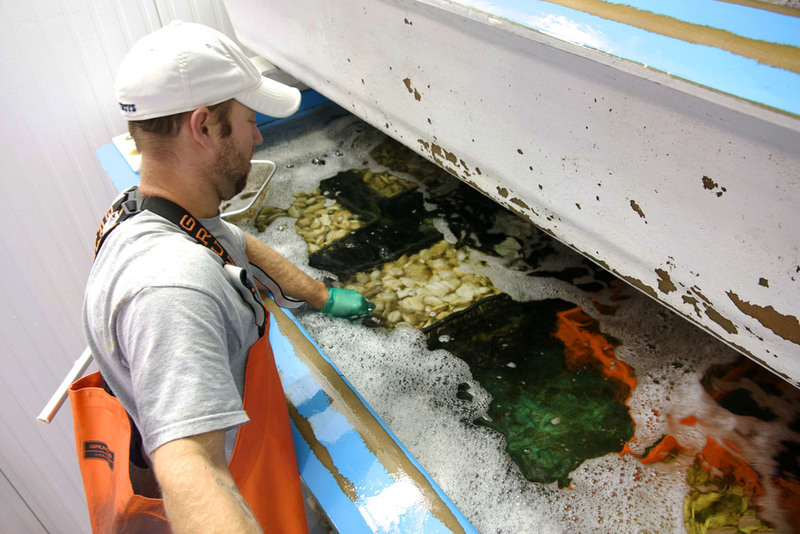 We take lots of loving care of our premium oysters and shellfish, and it all takes place at our Boston-based facility complete with a wet-storage system. We take loving care of our bivalves to ensure they taste great when they arrive at your door! Juliano, our Wet-Storage Specialist, adjusting Perfectly Purged Steamers in the wet-storage system. The Shop is an 8000 square foot, HACCP-compliant, refrigerated building. We are located in the New Boston Seafood Center in the Seaport District of Boston. We are right next door to Araho Transfer, and in close proximity to Ocean Express, Sea Cap, CFI, J&B, and Logan International Airport. Our location enables fast receiving and shipping turnaround for our shellfish to reach our customers as fresh as possible. We have a 5 ton ice machine, which we don't use sparingly! This guarantees that when your product leaves our cooler, it stays cold on its way to you. In 2008, we built a state-of-the-art wet-storage system to purge steamers and hold other shellfish species. There are only five of these systems permitted in Massachusetts. We do not manufacture the water for our system; instead, we painstakingly pump nutrient-rich seawater from Duxbury Bay, MA and truck it all the way back to our facility. Our system has five different methods of filtration (including UV lighting) to guarantee the water is as pure as possible. We also test our water weekly in a government laboratory to ensure purity and safety. The benefits of buying clams that have been purged in this system is a grit-free product with no breakage and superior shelf-life. We also hold European Oysters (Belons) in our system to guarantee freshness, quality, and shelf-life. See our Other Products page for more details!